"We were electrocuted with enough electricity to last Egypt for 20 years," one man yelled during his final words before an Egyptian court. Mahmoud al-Ahmadi was among 9 suspected Muslim Brotherhood members sentenced to death for involvement in the assassination of Egypt's top prosecutor Hisham Barakat on June 29, 2015. The men were executed by hanging in a Cairo prison on Wednesday, which drew condemnation from groups like Amnesty International, given widespread reports that their confessions were obtained through torture. 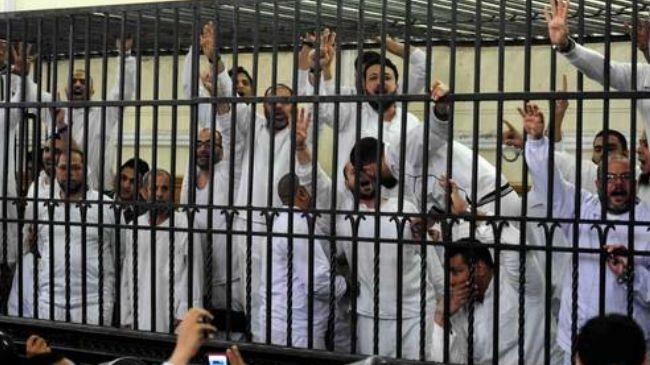 Human rights groups have complained of Egypt's mass trials. Barakat had been targeted and killed by car bomb when his convoy drove through the Egyptian capital in 2015, two years after General Abdel Fattah el-Sisi removed the Muslim Brotherhood President Mohamed Morsi in a military junta following the chaotic Arab Spring protests. Only two weeks into November, this brings the total number of executions in Egypt thus far this year to 15. Maya Foa, director of an international body of lawyers who spotlight human rights abuses called Reprieve, told Al Jazeera, "As these latest executions show, President [Abdel Fattah] el-Sisi's use of the death penalty is now a full-blown human rights crisis." The Sisi government has increasingly come under fire for its broad use of the death penalty following confessions obtained under duress, as well as mass trials. Reprieve says some nearly 1,500 individuals remain on death row, among them juveniles. Since taking power the Sisi government has gone on the offensive against the highly organized Muslim Brotherhood opposition. In December 2013, months after Morsi's removal, the group was branded a terrorist organization. Ahead of Wednesday's mass execution Amnesty International appealed to authorities to halt the hangings of the nine men. Amnesty's Deputy Regional Director for the Middle East, Najia Bounaim, accused Egyptian security forces of torture: "There is no doubt that those involved in deadly attacks must be prosecuted and held accountable for their actions, but executing prisoners or convicting people based on confessions extracted through torture is not justice," she said. "At least six men have already been executed earlier this month after unfair trials. Instead of stepping up executions, the Egyptian authorities should take steps to abolish the death penalty once and for all," she added. Meanwhile, since Egypt's politically tumultuous "Arab Spring" period which ultimately resulted in Gen. Sisi gaining a firm hold on power, US administrations (from Obama to Trump) have kept largely mum on Egypt's human rights record, content to keep American weapons flowing to the Egyptian military and to ensure Cairo keeps the peace with Israel.